Come the new year many car manufacturers launch new promotions to stir up interest in their cars, covering everything from cash discounts or free equipment to low rate finance. We’ve rounded up a selection of the best offers from all of the major manufacturers, to help make choosing your new car easier. Audi is offering the A1 Black Edition until March 31st – it’s a special edition with, as you’d expect, various black styling enhancements, as well as climate control and Audi sound system. It’s £1100 more than the equivalent S Line model. Further equipment offers, including, Sport and Technik equipment packages, are offered on A3 and A4 models. Alfa Romeo is offering 0% APR finance over three years on the MiTo and Giulietta, based on a 35% deposit. The offer includes three years/ 30,000 miles free servicing, three years unlimited mileage warranty, and three years AA Contact road side assistance. BMW is offering complimentary specification upgrades on the 1 Series, 3 Series, 5 Series, 7 Series, X1, Z4 and M3. Complimentary equipment varies depending on model, but as an example, buyers of the 525i or 525d are offered a free Professional Multimedia pack, including navigation, BMW Assist, voice control and Bluetooth with telematics. There’re also low rate finance offers on most models in the BMW line up. Chevrolet is offering reduced prices on a selection of models. The Spark+ 1.0 is reduced from £8475 to £6975, saving £1500. The Cruze hatchback in 1.6 LS form is reduced to £11,995 from £13,995, saving £2000, and the Orlando 1.8 LS is priced from £13,995, down from £16,410. Finally, buyers of the Captiva 2.2 VCDi in LS trim will save a substantial £4000 off the £21995 list price. Citroen is giving buyers of the C1, C4, C4 Picasso and C4 Grand Picasso ‘free fuel for a year’ in the form of a pre-paid mastercard . It covers the equivalent of the cost of fuel for 10,000 miles, based on the official combined cycle economy. Citroen is also offering the Black and White editions of the C3, which are priced from £9995 and come with air conditioning, alloy wheels, customised dashboard and front fog lights. Fiat is providing low rate ‘i-Deal’ finance packages on all models in the range from January to March 2012. Additionally, buyers of the Panda 1.2 Active save £1800 off the list price, and the Panda MyLife is reduced by £2010. Most models in the Ford range are offered with ‘customer saving’ deductions, including £950 off the Ka Studio 1.2, £500 off the Fiesta Studio 1.2, £1000 off the C-MAX Zetec 1.6, which is also offered with free parking sensors, and £1000 off the Grand C-MAX Zetec 1.6. There are also low price personal contract hire packages on the Focus Zetec, Ka Edge, Fiesta Zetec and Kuga Titanium. Honda is allowing buyers to ‘create’ offers of their own. 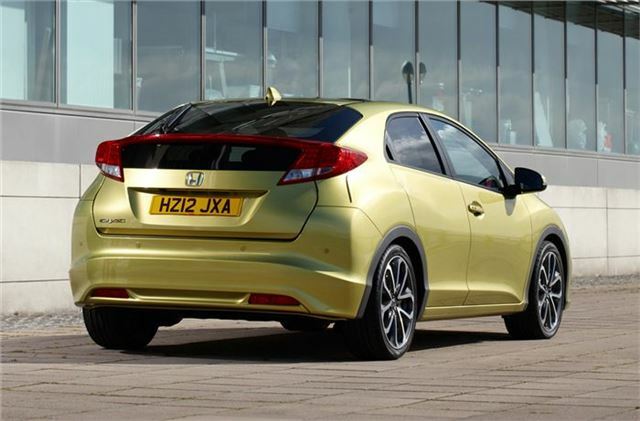 The Jazz, CR-Z, new Civic, Insight and CR-V are all available, and the offer allows users to select three of the following: flexible finance, insurance cost contribution, free road tax for between one and three years, 4th year ‘Extended Happiness’ guarantee, or four years complimentary servicing with roadside assistance. Flexible finance allows users to configure their preferred term length, annual mileage, and deposit amount on either personal contract purchase (PCP) or hire purchase (HP). The i10, i20 and i30 are all available with customer saving reductions, with £1350 off the i10, £1600 off the i20, and £3085 off the i30. Hyundai is also offering buyers a Trade and Upgrade deal, which guarantees a value of at least £1500 for any car aged between seven and ten years when it’s used as a part exchange against a new Hyundai. Jaguar is offering 0% finance on XF, XJ and XK models based on a 20% deposit. After 23 monthly payments, buyers can either pay a the outstanding balance and keep the car or give it back to Jaguar. Kia has a range of deals on various models across the range. Buyers can save up to £750 on the new Rio, up to £500 off the Soul and Venga, £1500 on the Sorento, £1000 on the Sedona, £2000 on the Carens, and as much as £3511 on the Cee’d. Buyers opting to choose a finance package will benefit from 0% APR over 36 months on the Soul and Venga too, based on a 50% deposit. The Range Rover is available with 0% APR over 24 months, and low rates of 5.9% APR are offered on the Range Rover Sport, Land Rover Freelander 2 and Land Rover Discovery 4, although as with all finance packages, everything is subject to terms and conditions. Lexus is offering £1900 worth of free equipment with the RX 450h, including smoked headlamps and wheels, front and rear under-runs, and a choice of either a panoramic windscreen or a power sunroof. Lexus will contribute up to £1000 towards a buyers finance deposit, too, on the IS series, CT 200h, and RX 450h. Mazda is offering to pay the equivalent of VAT on selected Mazda2, Mazda3 and Mazda6 models. Additionally, buyers of the Mazda5 will get a £2679 discount, and those who want to buy am MX-5 or Mazda3 MPS on finance will benefit from a £750 deposit contribution. Mercedes-Benz is offering free upgrades to buyers of the C-Class and C-Class Estate. Buyers can upgrade to Sport trim for free, saving £1700. Sport trim adds AMG bodystyling, AMG alloy wheels, high beam assist, black roof lining and a restyled grille, amongst other things. MINI’s latest offer, called 50/50, offers buyers the opportunity to pay half the value of their new Cooper S, SD or John Cooper Works model now and then pay nothing for two years. After that, buyers can pay the remaining 50%, part exchange for a new model or simply hand the car back with nothing to pay. MINI is also offering one year’s free insurance on the Cooper, Cooper D, Convertible, Clubman and Countryman. Mitsubishi is offering to pay for the equivalent of free fuel for a year (based on the average person’s 10,000 mile per year average) with ASX, Colt, Outlander and Shogun. There’s also a selection of competitive finance offers. Advantage Nissan offers buyers a comprehensive hire purchase package, covering free or reduced cost servicing, roadside assistance and low rate finance over three or four years. It’s available with the Micra, Note, Qashqai, Qashqai+2, X-Trail and Juke until March 31st 2012. Peugeot are offering customer savings of as much as £2550 off the 308, 5008, 207, 3008 and 107. Buyers can also choose the Just Add Fuel offer, which takes all of the hassle out of car ownership by combining servicing, tax, warranty, breakdown cover, comprehensive insurance and personal contract hire or purchase into one monthly payment. Just Add Fuel is offered to buyers of the almost all models in the Peugeot range. Renault is offering 3000 miles worth of free fuel across its range, as well as cash savings on selected models, including £1000 off the Twingo and Clio, and £1600 off the Megane. There’s also 0% APR on various hire purchase options. SEAT’s latest ‘Drop Everything’ offer means buyers of the Ibiza SC Copa can save £2310 off the RRP, bringing the price down to £9995. It’s a well equipped model, with climate control, rain sensing wipers and mp3 compatible sound system. The Leon S Copa Ecomotive is also reduced when bought on a personal lease deal, costing £199 per month over 42 months after a £3752 deposit. Skoda has cut the price of the Fabia SE 1.4 MPI by 25%, from £11,995 to £8995. It’s also offering to pay the equivalent of VAT on most models, including the Octavia, Fabia and Superb. All models in the Subaru range are offered with low rate finance, with APR of below 5% on all models depending on the initial deposit. Suzuki will pay the equivalent of VAT on the Swift, Splash and Alto models, meaning savings of as much as £2,335. Toyota is offering finance deals with 0% APR representative on the Yaris TR, Aygo Go! Auris Edition, Verso TR and Auris Hybrid T Spirit. Vauxhall’s Flexible Finance plan means buyers can choose the contract term and deposit amount best suited to them, so they can pay a monthly rate tailored to their needs. There’s also a 0% finance offer on various models including the Astra and Corsa. Vauxhall Choices allows buyers to choose whether to pay off the outstanding balance, return the car or part-exchange it at the end of the Personal Contract Purchase term. The Polo, Golf Plus, Eos, Touran, Touareg and Phaeton are all reduced at the moment, with reductions from £500 to £5520, depending on model. Polo buyers also benefit from a free insurance offer, and fixed price servicing is available across the range. Volvo has numerous offers, including free extra equipment on the S40, V50, XC70 and V70 when buyers choose BLIS blindspot assist, and reduced price extra equipment upgrades on the XC60 and XC90. Volvo also has a ‘swappage’ scheme which gives extra discount for part exchange vehicles first registered before 31st December 2004. Swappage is available with C30, C70, S40, S80, V50, V70 and XC70 models.